This cleaner will bring back the tackiness your ball had when it was new. You'll get the reaction you need to stop leaving corner pins. Best of all, it's Approved for use anytime by the USBC. At this time, it is only available for 8oz. can it be used on urathane balls? Yes, it can be used on any ball surface. Unfortunately, this is only offered in 4 oz and 8 oz. 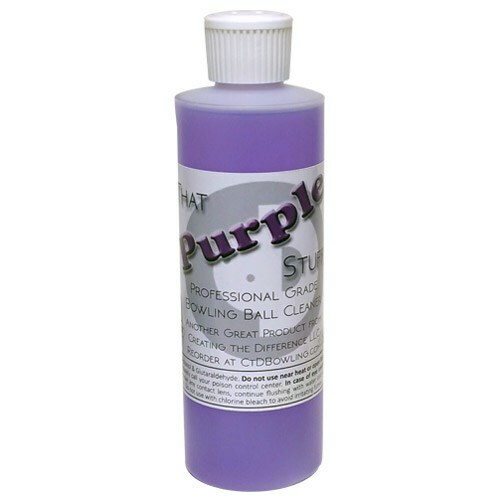 Due to the time it takes to produce the CtD That Purple Stuff 8 Oz Flip Top ball it will ship in immediately. We cannot ship this ball outside the United States.